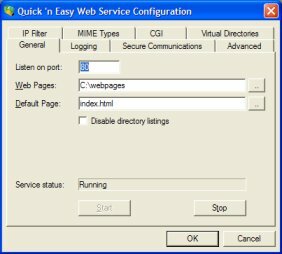 WebService.exe is a NT service version of Quick ‘n Easy Web Server. This service enables you to run the Web server even when you're not logged into Windows. 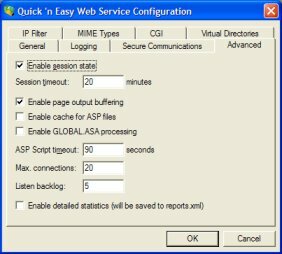 Quick ‘n Easy Web Service has all the features of the GUI version, but is designed to run faster and use less memory. - Easy to setup and configure. - Runs a NT Service. - Native ASP support (Request, Response, Server, QueryString and Form collections, Global.asa, Session and Application objects, etc). - CGI support for running PHP, Perl, MySQL and much more! - SSI (Server Side Includes) support. - Support for SSL (Secure Socket Layer). - ASP Cache Manager to improve performance of ASP pages. - IP Filter to block/allow only specific IP addresses. - Support for GET, POST, and HEAD methods (form processing). - Advanced server settings which can be used to optimize performance. The service will only run under Windows NT4/2000/XP/2003 and Vista (32 bits) but not Win95/98/ME. This application includes a setup.exe file, which makes it easier to setup this service. - Ask for install directory. - Copies all files to this directory. - Copies webcfg.cpl to the system32 directory. - Runs webservice.exe -i to install the service in the service control manager. Quick ‘n Easy Web Service (NT service edition) is now FREE if you purchase Quick ‘n Easy Web Server!